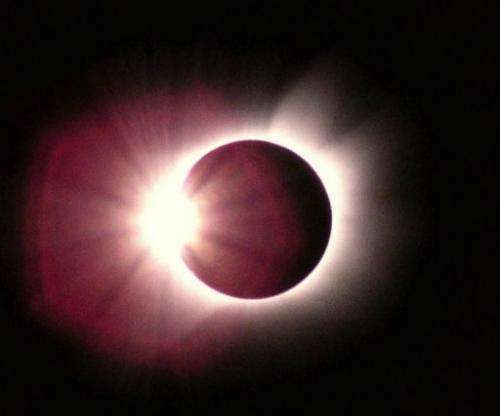 This diamond-ring shaped solar eclipse photo, released by the Japanese Antarctic observation team in 2003 was taken from Dome Fuji. Special darkened glasses were selling out in Japan on Friday as anticipation built ahead of a "ring" solar eclipse above one of the most densely populated parts of the planet. A swathe of the country will be able to see the annular solar eclipse, when the moon passes in front of the sun, blocking out all but an outer circle of light. Astronomers say the greater Tokyo area, home to more than 30 million people, will be a prime spot to see the event, which has not been visible in the capital for 173 years. Eclipse-viewing glasses were flying off the shelves and television stations were planning live broadcasts amid stark warnings not to look directly at the sun. One of the most ambitious projects to mark the moment was being mounted by electronics giant Panasonic, which had sent an expedition to the top of Mount Fuji to film the phenomenon using solar-powered equipment. "Our goal in this project is to broadcast the world's most beautiful annular eclipse from the highest mountain in Japan," the company said. Graphic showing the path of a solar eclipse that will traverse the northern Pacific on May 20. A climbing team has taken high capacity rechargeable batteries to the base camp, and is planning to use the power of the sun to "broadcast this moment of a century from the top of Mt. Fuji," 3,776 metres (12,388 feet) high. "This is the place closest to the sun (in Japan)," said Panasonic project manager Hisao Tsugita, who said his team had begun charging the batteries on Thursday. His expedition will head to the summit on Sunday ahead of the eclipse, due to be visible from the mountain top at around 7.30 am Monday (2230 GMT Sunday). "We want to show the annular eclipse from Japan to people around the world," he said. 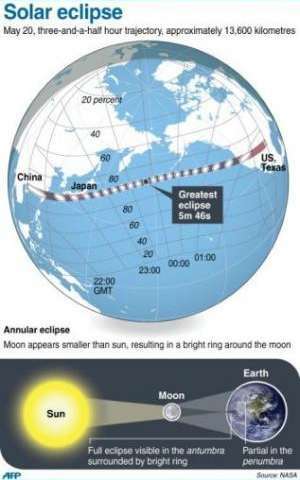 The path of the eclipse will span "a 240 to 300 kilometre-wide (150-185 mile) track that traverses eastern Asia, the northern Pacific Ocean and the western United States", according to the US space agency. The eclipse begins at sunrise in southern China at 2206 GMT Sunday and swiftly travels eastward to the southern coast of Japan, NASA said. With excitement rising in the country, public health officials have been out in force warning of possible eye damage for anyone who does not take proper precautions for the eclipse. However, Japan's weather agency has been giving a slightly different warning -- the event might not be visible at all. According to historical data, China and Japan are likely to be swathed in cloud at the time of the eclipse.